I totally missed this entry last week – but he is great! Haha. Wasn’t expecting to see Santa. But I guess he needs to be a bit of an acrobat to do the things he does. Nice illo! I am a big fan of yours. Thank you so much for all the smiles. I have featured you and a piece of your artwork on FAT Tuesday (Featured Artists Tuesday) this morning. I have put a link to your blog. You are such an inspiration! Thank you for sharing your wonderful humorous whimsical artwork with us! Well I came for my dose of smiles before I visit sombre Jack Foster! Heh. Only a twisted mind would think of this — no that’s not right. a skinny santa doing acrobatics _ I love how your mind works. Kind of like the reverse of mine. I remember when I could do that….NOT! ;O) Love this guy Krista! He is amazing! Checking his “To Do ” list while putting the perfect ribbon on the perfect gift. PERFECT!! I always like to zoom in on your work and admire all the little “Krista Kurly Kues”. Thanks so much my friend, I send you so many, many hugs today! I love this! Christmas is definitely a balancing act! Super cool swirls and movement. Awesome work! 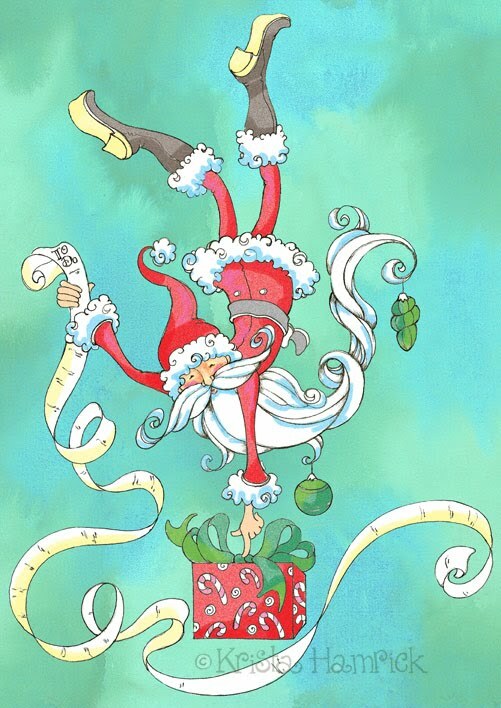 Oooo…Acrobatic Santa, huh? I do wonder if he still goes HO HO HO? Or maybe now he only goes HE HE HEE..??? Hackckaakakaakaaa…!!! HO HO HO! Wow, he’s got more power in his finger than I do in my entire body! Never thought of Santa as the very flexible type, but I guess you have to be to fit through all those chimneys. Fantastic piece, Krista! I love, love, love the colors! Hey! Santa’s been really getting a workout! Get that man some cookies! :o) Great, delightful image! I love it! How fun!!! This is fun and most enjoyable. Oh, this brought a smile to my face. I always do think of Santa as an acrobat! Santa has to be an Acrobat to do all that he does. This is wonderful. Great illustration. Wonderful! I love the colours you’ve used and the twisting and turning makes it such a lively piece. Feeling a bit festive now! oooooo, I love your acrobatic Santa!!! That background is really beautiful too! I’m lovin the ornaments in his beard.